Senior Laura Gartelman started seven games, most on the team. The women’s soccer team will return all but three players. 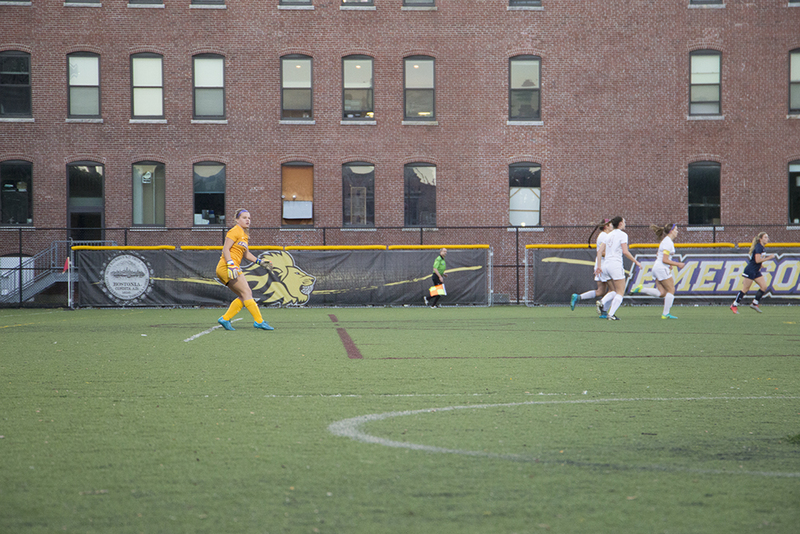 After qualifying for the NEWMAC playoffs last year, Emerson’s women’s soccer team had high expectations for this year, but injuries to key players held them back. The Lions finished ninth in the NEWMAC this year, posting a 3-11-2 record. Junior forward Paige Haley suffered a torn ACL in late September that ended her season, and senior goalie Laura Gartelman battled a hip flexor issue throughout the season. A tough round of opponents from California and the NESCAC kicked off the season with an 0-4 start. Emerson recovered in time for conference games, winning its first three NEWMAC matches for the first time in program history. From there, Haley’s injury and inconsistent goalie play led the team to lose its final seven games. Haley led the squad in goals at the time of her injury, and her absence hurt the Lions’ offense, which relied on her and junior forward Jess Frost. The end of the season saw Emerson take the second fewest amount of shots and score the fifth fewest goals in the conference. Frost said she was forced to adapt to the situation by receiving the ball more. Unlike Haley, Gartelman’s injury did not cause her to miss the rest of the season, but she did miss four conference games. But Emerson’s goalkeeper issues ran deeper than Gartelman’s absences. Throughout the season, the Lions struggled to find a proper replacement for Melanie Escobar, who was named NEWMAC Defensive Player of the Week twice and pitched four shutouts as their goalie last year. Within the conference, Emerson allowed the second most goals. While Gartelman was out, Suvak turned to freshman Mary Elizabeth Allen. With the conclusion of the 2017 campaign, Suvak has shifted his focus to next year. He said freshmen Sophia Detweiler, Amanda Benavente, Modesty Sanchez, and Madeline Leto impressed him this year and could make an impact in the future. Suvak said the Lions are also addressing needs through recruiting. The program is expected to return most of its players with only three graduating in the spring. As one of the seniors leaving, McGuire said the Lions are in a good spot. Suvak said he feels confident they will have a high quality unit next year. “I’ve always thought that, even going into this season, next year is going to be one of our best teams that we’ve put on the field,” Suvak said.